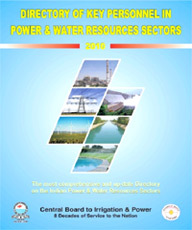 The Central Board of Irrigation and Power (CBIP) is rendering dedicated services to professional organizations, engineers and individuals in the country and abroad for the last more than 8 decades in the twin disciplines of Water Resources and Energy to facilitate optimal development of Water Resources and Energy by promoting the application of modern techniques thereby leading to accelerated development. We present you with the latest edition of CBIP Directory which covers the important contact details about key personnel in power and water resources sectors in India. This edition contains entries of about 7000 personnel from about 800 organizations. CBIP is publishing this directory every year which is extensively being used by the Government and private sectors. This directory has also been quite useful to the other utilities / manufacturers / Individuals etc. engaged especially in the fields of Power and Water Resources Sectors. Of late, owing to the liberalization of Govt. policies in allowing the Private Sector to participate in a big way, the need for close interaction among the prospective investors, private sector executives and senior level executives of the Govt. Sector, Public Undertakings, etc. involving Power and Water Resources Sectors have become very important and essential. In order to fulfill this need, CBIP, has made an endeavour to bring out this Directory by extensively including key personnel from Private Utilities, Consultants, EPC Contractors, Construction Firms, Equipment Manufacturers, Power Trading Companies, Training Institutes etc. apart from Government sector particularly who have become members of CBIP. Apart from above, vigorous efforts have been made by CBIP in improving the Directory which has been innovatively designed and improved upon categorizing the entries under various sub¬sections, viz; Central Ministries and Departments, Central Sector Organisations, Regulatory Commissions, State Govt. Departments, Private Sector Utilities, Power Producers, Developers, Generating Companies, EPC Contractors, Consultants, Manufacturers, Trading Companies and Training Institutes etc. This Directory has been made as "easy to refer" as possible. Some of the information also has been collected from secondary sources.